The historical link between Mining and the Bouse area is unquestionable. Prospectors started arriving in the 1860's when Bouse was called Brayton. The biggest draw was the availability of copper and gold. There have been many mines within the bouse area, many owned over time by multiple mining companies. The Bouse Assay Office. a 625 feet square building, was built about 1902 by the bouse Townsite, Land & Improvement Company and was used as their sales office. It has not been determined when it became the Assay office, however assay services were provided from Bouse for Swansea and other mines up and down the Bill Williams River. The earliest assayer recorded in Bouse was P. R. Brown who appears in the 1909-10 Arizona State Business Directory. Other sources have shown shown the C. C. Thompson was the U.S. Mineral surveyor for many years. C. C. Thompson lived in the building until the early 1960s. Besides surveying Swansea and other mining areas, he also surveyed the original Bouse Townsite in 1910, and the Worley addition to the Bouse Townsite in 1916. Thompson lived to his 80s or early 90s. In 1964 Mrs. C.L. Terry lived in the building after her husband died. Mr Terry had the Black Trust Group Mine and the Bird Group Mine. In 1990 the building was sold by W.E. Bisgaard of Holtville, California (whose uncle was C.C. Thompson), to the Bouse Chamber of Commerce for $1,000. The price was split between the Bouse Chamber and the community members who pledged $10 a month. Greg Upton and Cliff O'Niell contacted the Arizona State Parks Board for a grant to restore the old Assay Office building in 1991. When restoration was completed, the Bouse Chamber of Commerce opened the building to the public as a Museum. Many documents and photographs of Early Bouse are housed in the Museum. It also houses a model of Gizmo and other artifacts from Camp Bouse. 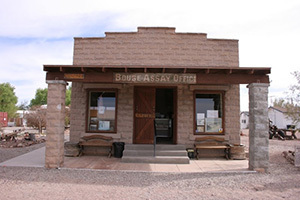 When the Bouse Chamber of Commerce made the decision to utilize the Assay Office as Museum they brought in several pieces of old mining equipment and moved an old mining shack to it's present location beside the Assay Office. Thus creating a place where visitors can see what miners and their family lived in as they worked the mine.